Did you know that your Great Grandma had a pharmacy just outside her back door – it was her herb garden! In fact, back then there probably wasn’t a pharmacy nearby, so she had to take care of the family’s needs with a little help from nature. Today you have access to pharmacies, but like many others, you too may prefer the natural cures that were good enough for your ancestors. After all, herbs were our only medicines until a few hundred years ago, and since the dawn of time they’ve managed to keep humankind alive and well. Quite a track record. Just having our own herb garden or just a few plants growing in a window box can be calming and relaxing. When you are taking care of your plants, watering them, pruning and harvesting them with love and appreciation, all anxiety and stress can melt away. The sight and scent of the natural herbs seems to flick a relaxation switch in our mind. If you don’t have an herb garden in your yard – and to be honest today not many people do, then you can still get your herbs from a health food store. 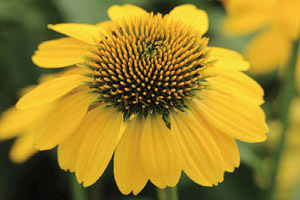 Echinacea – Native Americans relied on this herb for symptoms of respiratory distress. It’s widely sought after today to combat symptoms of colds and flu. Echinacea is also a common ingredient in commercial cough drops, although the amount in that product is less than what you could get in an herbal formula. Echinacea is also important in supporting the immune system function. Ginkgo is being recognized in natural health as an herb that improves brain function and memory. The full extent of its power isn’t fully known, but it does have the ability to improve circulation. Ginkgo Biloba is also an element advertised in commercial tonics and tablets, however, consumers have to be careful that the quality and quantity of this herb is sufficient to matter. St. John’s Wort was a little known herb until it came to attention as a natural alternative to anti-depressant medications. Critics in the medical profession say that the dosage is not as predictable as with prescription medications. Proponents of herbal remedies counter that the safety and lack of addiction potential still make St. John’s Wort a good alternative to prescription drugs. Chamomile is more than a flavorful tea, it’s an herbal remedy that relieves the discomfort of muscle cramps, eases digestive problems including gastro-intestinal irritation, ulcers, colitis and irritable bowel syndrome, plus it reduces anxiety. Used as an herbal tea it also works as a remedy for insomnia. Ginseng is an herbal remedy that has been handed down from ancient Chinese culture. Ginseng is an adaptogen, a substance that can ward off physical and mental strain so that the body can return to normal levels of functioning. That’s why Ginseng is recommended by herbalists for fatigue and stress, particularly when recovering from an illness. According to the American Medical Association Journal, over 100,000 Americans die in hospitals every year due to side effects from regularly prescribed medications. Throughout America, a huge amount of medication is prescribed on a daily basis, and the medical community openly acknowledges that fact that it does not have any cure for several common diseases that affect people. The late twentieth century saw a re-emergence of herbal remedies with the popular of herb-based medications increasing dramatically. More and more hospitals are now offering herbal remedies as complementary alternative treatments with conventional medicines. If you are looking to incorporate more herbal remedies in your medicine cabinet, these five herbs are easy to find and put to use in either their natural state, or as herbal nutrition supplements.